New NAHB estimates based on the latest data show that, on average, regulations imposed by government at all levels account for 24.3 percent of the final price of a new single-family home built for sale. Three-fifths of this— 14.6 percent of the final house price—is due to a higher price for a finished lot resulting from regulations imposed during the lot’s development. The other two-fifths—9.7 percent of the house price—is the result of costs incurred by the builder after purchasing the finished lot (Figure 1). In this article, the focus is exclusively on the costs of regulation. Governments presumably impose regulations under the belief that they will generate some benefits, but no attempt is made to estimate such possible benefits here. The rest of this article explains the data underlying Figure 1 and discusses trends in regulatory costs since NAHB released its last set of estimates. President Obama’s recent Executive Order on Reducing Regulatory Burdens has focused attention on the issue, making it a good time to revisit NAHB’s estimates of the impact that regulations have on the price of a new home. 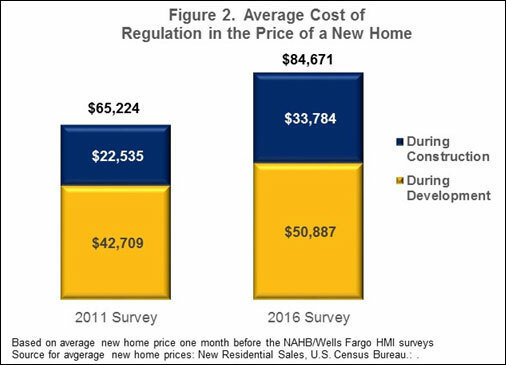 Among the conclusions that emerge from the new analysis is that the average cost of regulation embodied in a new home is rising more than twice as fast as the average American’s ability to pay for it. 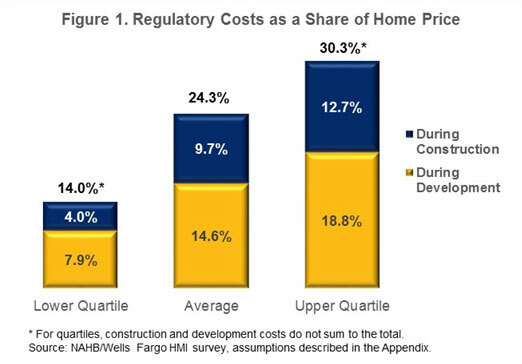 Moreover, the article discusses the possibilities that 1) the costs embodied in a new home are understated because some types of regulation impact costs in a way that is difficult for builders to see, and 2) the pace of regulatory cost increases is accelerating due to the number of regulations in the pipeline. Regulations come in many forms and can be imposed by different levels of government. At the local level, jurisdictions may charge permit, hook-up, and impact fees and establish development and construction standards that either directly increase costs to builders and developers, or cause delays that translate to higher costs. State governments may be involved in this process directly or indirectly. Several states, for example, have adopted state- wide building codes. And although impact fees are imposed by local governments, such fees typically cannot be imposed without enabling legislation at the state level. The federal government can also impact the price of a home—for example, by requiring permits for stormwater discharge on construction sites, which may lead to delays in addition to the hard cost of filing for a permit. Data on how these regulations may impact the housing industry is limited. To fill in the gaps, NAHB’s Economics and Housing Policy Group asked a series of special questions on the topic in the survey for the March 2016 NAHB/Wells Fargo Housing Market Index (HMI). The HMI goes to a panel of single-family builders stratified by size (number of housing starts) and geography (the four principle census regions). The March 2016 questionnaire on regulatory costs is available in the “Additional Resources” box at the top of the online version of this article. Notice that each question includes a specific instruction to indicate “0” when a particular cost is negligible. This is done to avoid possible confusion over missing entries and allow jurisdictions where certain costs are in fact negligible to be captured with reasonable certainty to avoid overstating costs. The questionnaire is structured around the leading case of a lot that is developed by a developer, then sold to a builder, who builds a home on the lot and sells it to the ultimate buyer. The HMI panel of single-family builders includes many who also develop lots and are therefore able to answer questions about regulation during this stage of the process. To produce the average cost estimates, the survey responses are combined with other information—terms on construction loans, how long it takes to build a home, profit margins, etc. The source of each assumption used in the calculations is explained in an appendix, also available under “Additional Resources.” In general, the assumptions rely on long-run averages or forecasts, to capture normal economic conditions, rather than only those that are most current and possibly anomalous. Table 1 shows the resulting estimates of regulatory impacts on the price of a developed lot that would typically be sold to a builder. On average, regulation accounts for 54.7 percent of the price of the lot. Among the five components of regulatory costs shown in the table, the average impacts range from 5.1 percent of the lot’s price for “pure” cost of delay to over 16 percent for changes in development standards (such as setbacks or road widths). The pure cost of delay in the table refers to the estimated cost that the delays of waiting for approval and complying with development regulations would impose in the absence of any other type of regulatory cost. Delay also factors into other regulatory costs listed in the table through higher interest payments on acquisition and development loans that accrue over a longer period of time. On average, survey respondents said complying with regulation adds 6.6 months to the development process, but the variation was considerable, with the responses ranging from no time at all to over 5 years. To illustrate the variability in regulatory costs, in addition to averages, Table 1 shows the upper and lower quartiles (costs are below the lower quartile for 25 percent of respondents, and above the upper quartile for 25 percent). While on average regulation accounts for 54.7 percent of the lot price, the quartiles give a range of 29.8 to 70.7 percent. Although the averages of the cost components in the table sum to the bottom line total, the quartiles generally do not. Adding the percentages for the five lower quartiles, for instance, produces a result substantially smaller than 29.8 percent. The implication is that individual developers can avoid or minimize particular types of regulatory costs depending on where in the country they operate—but not all of them. 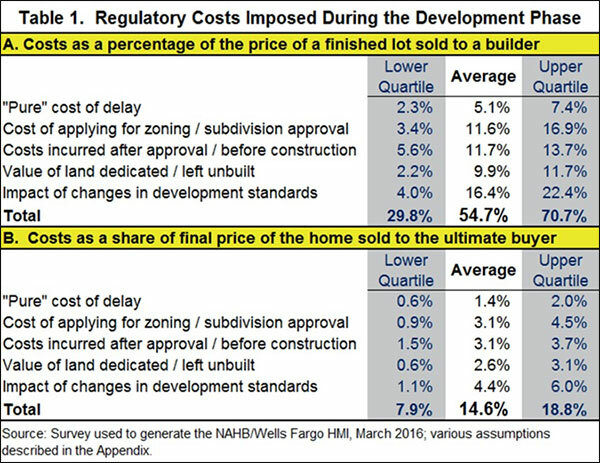 Table 1 also shows how the impact of regulation during development translates into an impact on the final price of the home. The calculations assume that a finished lot accounts for 21.8 percent of the final house price and that 22.3 percent is ultimately added onto the lot price when the home is sold, to account for interest and other costs incurred by the builder between time of acquiring the lot and closing, and a normal profit margin, as explained in the Appendix. The bottom line is that regulation during development on average accounts for 14.6 percent of the final price of a single-family home, and the quartiles give a range of 7.9 to 18.8 percent. Table 2 shows the impacts of regulation imposed during construction, after a builder has acquired the lot. During the construction phase of the operation, regulation on average accounts for 14.5 percent of construction costs. Of this, 5.3 percent is the actual hard cost of fees paid by the builder. The remaining 9.2 percent is the cost of changes to construction codes and standards over the past 10 years. As of 10 years ago, building codes were well established in most parts of the country and had been revised many times over a period of decades. A 9.2 percent increase since then does not mean all subsequent code changes have been unnecessary, but does raise a question about how well possible cost impacts are being factored into the code revision process. Again, the table converts regulatory costs to a percentage of the final house price. For costs incurred during construction, the calculations assume that construction costs account 56.0 percent of the house price, and that the costs are increased by 19.2 percent before being passed on to the buyer (as described in the Appendix). The bottom line is that regulation imposed during actual construction of a single-family home accounts for, on average, 9.7 percent of the home’s final sale price, with the quartiles giving a range of 4.0 to 12.7 percent. Adding together costs imposed during both development and construction produces the result highlighted in Figure 1. On average, regulations imposed by government at all levels account for 24.3 percent of the final price of a new single-family home built for sale. The quartiles give a range of 14.0 to 30.3 percent. 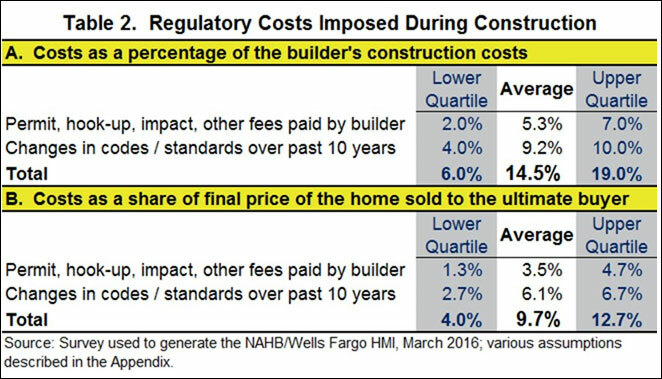 NAHB’s previous estimates of regulatory costs were published in a 2011 Special Study. The estimated share of a new home’s price attributable in that study was similar—25.0 percent, compared to the current 24.3 percent. However, the price of homes increased substantially in the interim. According to the Census Bureau’s series on New Residential Sales, the average price of a new home sold went from $260,800 to $348,900 over that span. Applying the average percentages from NAHB’s studies to these home prices produces an estimate that average regulatory costs in a home built for sale went from $65,224 to $84,671 in the roughly five-year period from April 2011 to March 2016—a 29.8 percent increase. The impact of costs imposed during construction increased the fastest, rising by almost 50 percent, from $22,535 to $33,784, but even the more modest change in the impact of regulation imposed during development ($42,709 to $50,887) represents a 19.1 percent increase (Figure 2). 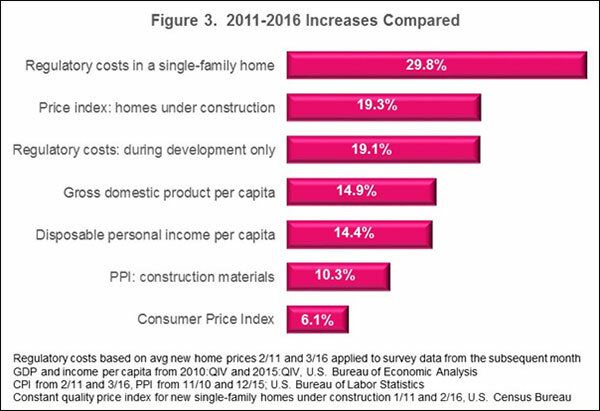 The increase in regulatory costs during development is similar to the 19.3 percent increase in the Census Bureau’s quality adjusted price index for new homes under construction, but higher than the 14-15 percent increase in GDP or disposable income per capita, which in turn is higher than either the increase in the cost of construction materials or the CPI (Figure 3). Perhaps the most interesting (and disturbing) comparison in the figure is between the 29.8 percent increase in overall regulatory costs embodied in the price of a single-family home built for sale and the 14.4 percent increase in disposable income per capita. In other words, the cost of regulation in the price of a new home is rising more than twice as fast as the average American’s ability to pay for it. It is also the case these estimates or regulatory costs could be understated, as some types of regulation affect costs in ways that are difficult for a builder or developer to see. For example, a builder would seldom know how much of the price of framing lumber may be due to tariffs or restrictions on softwood lumber imposed by the U.S. government. Similarly, to the extent that government agencies facilitate law suits, or promulgate confusing or contradictory regulations that increase the likelihood of law suits against business in the construction industry, it may drive up legal expenses in a way that would be difficult for a builder to quantify. Moreover, builders and developers have probably not yet felt all the impacts of regulations looming on the horizon. A substantial number of regulations have been implemented recently, are in the process of being implemented, or are under active consideration by key policymakers. EPA's Chesapeake Bay Cleanup Plan is not only driving up development costs in the effected states but is viewed as a template for establishing more stringent standards elsewhere in the country as well. OSHA’s new silica rules are set to go into effect next year, threatening to impose billions of dollars of extra costs on the construction industry. Local fire departments continue to advocate in favor of fire sprinklers, which, according to a recent Fire Protection Research Foundation study adds on average $6,000 to the cost of building a single-family home. The number of requests coming into NAHB’s Land Development Department to review proposals for higher development fees is on the rise. And so on. Based on this it would be reasonable to argue that the rate of increase in regulatory costs embodied in the price of a new home is accelerating. As of this writing, the latest available median price of new homes is for one month before NAHB’s March 2016 HMI was conducted. For consistency, this is compared to the median price in March 2011, one month before the HMI survey on which the 2011 study was based. Due to reporting lags, when computing cost or price increases, the latest statistics available when this is being written are compared to the statistics an equivalent number of periods prior to the 2011 HMI survey. For details, see the footnotes to Figure 3.